You can find a live site using this theme here and the corresponding source code here. 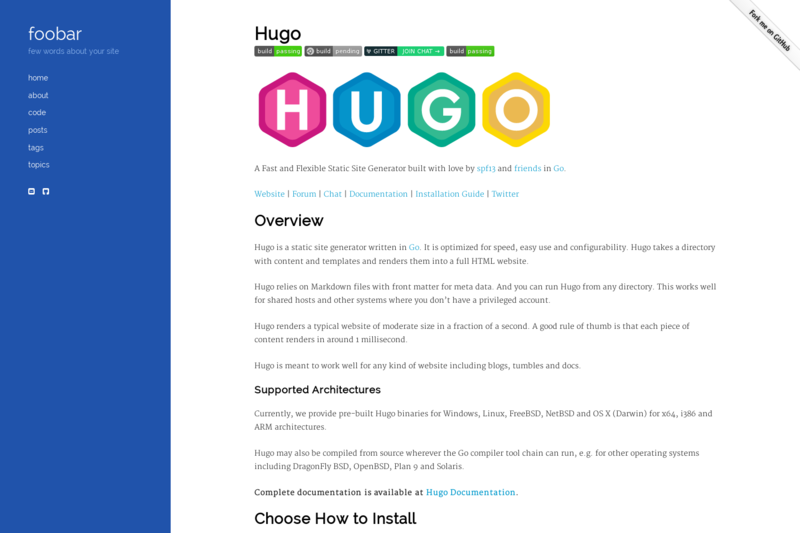 See the official Hugo themes documentation for more info. Just run hugo --theme=hyde-y to generate your site! An example of what your site’s config.toml could look like. All theme-specific parameters are under [params] and standard Hugo parameters are used where possible. copyright = "(c) 2015 yourname." # All parameters below here are optional and can be mixed and matched. # You can use markdown here. topline = "few words about your site"
footline = "code with <i class='fa fa-heart'></i>"
# false, true, "left", "right"
# Text for the top menu link, which goes the root URL for the site. # Default (if omitted) is "Home". # Check the static/css/highlight directory for options. googleAnalytics = "Your Google Analytics tracking code"
Create data/Menu.toml to configure the sidebar navigation links. Example below. Title = "Show list of posts"
Title = "Show list of tags"
Create data/FootMenu.toml to configure the footer navigation links. Example below. You can rebuild the stylesheet. To do it you need npm and run the task build:css. The task watch allows to rebuild the stylesheet when a change is spotted on scss/*.less files. If you’ve added theme = "hyde-y" to your config.toml, you don’t need to keep using the --theme=hyde-y flag! Although all of the syntax highlight CSS files under the theme’s static/css/highlight are bundled with the site, only the one you choose will be included in the page and delivered to the browser. Change the favicon by providing your own as static/favicon.png (and static/touch-icon-144-precomposed.png for Apple devices) in your site directory. Hugo makes it easy to override theme layout and behaviour, read about it here. Pagination is set to 10 items by default, change it by updating paginate = 10 in your config.toml. Highly customizable: every layout blocks are pieces of HTML code individually stored. Consistent hierarchy for the partials and templates files to assist the overrides of any layout block. Adjustable sidebar in config file. Project layout (badges, github ribbon) for posts stored in content/code/ folder. CSS built with KNACSS micro-framework. Client-side syntax highlighting through highlight.js, sane fallback if disabled or no JS - infinitely more flexible than the standard Hugo highlighting. Disqus integration: comment counts listed under blog entry names in post list, comments displayed at the bottom of each post. …many other small layout tweaks! Obviously largely a port of the awesome Hyde and Hyde-X themes. Questions, ideas, bugs, pull requests? All feedback is welcome! Head over to the issue tracker.